Can any one from lenovo tell me for sure - does Yoga910 support Wacom stylus or not??? No. There is no active pen support. Only a tablet-like touch screen. Speaking of products introduced at IFA 2016, Miix 510 has active pen support, Yoga book has a digitizer pad. If the answer is interesting press the star below to give Kudos. If your question is answered you can click ''accept as solution". Sigh. That image does indeed originate from Lenovo (it's in their press kit for the Yoga 910 launch at IFA 2016). However, as Pat says, the Yoga 910 does not apparently support the Active Pen. The spec sheet in the press kit does not mention Active Pen support at all, and I take that as confirmation that there is no support. "Lenovo makes every effort to ensure accuracy of all information but is not liable or responsible for any editorial, photographic or typographic errors. All images are for illustration purposes only." It wouldn't be the first time that Lenovo Marketing has opened its mouth to change feet, and it probably won't be the last. Yes, it IS for sure that the Yoga 910 does NOT have active pen support - just like the Yoga 900 before it. Only the Yoga 900s (with a smaller size screen) has Active Pen support. The Yoga 900 and 910 don't. As I said in my last post, that picture is simply wrong and misleading. Yoga 910s have black edges and different ports, so at that picture with ActivePenPro is absolutely Yoga910. It will be VERY stupidly to leave Yoga910 without WacomStylus support, because its only one device from Lenovo that can stand against Microsoft Surface (4Pro/Book) and SonyVaioZ (Flip/Canvas) in terms of overall specs (screen quality, style, case quality, battery, etc). Thinkpad X1Yoga interesting device, but have middle-level screens and not enough battery for "all day use" and for now its a "previous season notebook". Where you have found information that Yoga900s have WacomStylus support? Do you have any information about Yoga910s? Can you answer to any other of my questions, please? There is a Yoga 900, a Yoga 900s, and now a Yoga 910. The Yoga 900 and the new Yoga 910 have 13" screens, and do NOT have Active Pen support. The Yoga 900s has a 12" screen and DOES have Active Pen support. This is stated in the PSREF ("Optional Active Pen support"). The Yoga 900 specifications in the PSREF have no mention of pen support, in other words, the Yoga 900 does not support the Active Pen. The Yoga 910 does not yet have an entry in the PSREF, but the published specifications, like those of the Yoga 900 make no mention of Active Pen support. Furthermore, Lenovo stated at IFA2016 that the Yoga 910 has no Active Pen Support. I have both a Yoga 900 and a Yoga 900s, and I know full well that the 900 does not support the Active Pen, and the 900s does. You may think it very stupid of Lenovo to leave the Yoga 910 without Active Pen support, I couldn't possibly comment - but the simple fact of the matter is that it does NOT have Active Pen support. No. Sorry - I don't work for Lenovo. 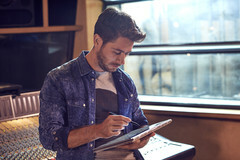 On that picture, in the press pack, it does looks like Lenovo Active Pen doesn't it? Yet we know for sure that Yoga 910 does not have active pen support. @gcoupe: Could you please advise if you can use Lenovo Active Pen as a passive pen on Yoga 900? I.e. using it like a capacitive stylus (finger-like touch). P.S. I agree that Yoga 910 can match anything in style, especially the metal black version looks very cute, indeed. There's also the Lenovo Miix, with active pen.